O-Bon or the Bon Festival, which takes place in mid-August, is the time of year when the spirits of deceased ancestors are said to return to their former homes. Young nuclear families depart the urban centers in droves, and head to their ancestral bases in the countryside, where the elders of the extended family tend the Buddhist family altar (butsudan) and the family grave. 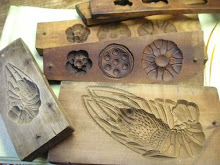 While many of us may associate the Bon season with Bon-odori dances and paper lanterns, there is a type of wagashi that makes its appearance at this time too. Bon-gashi (Bon confections), as they are called, are meant to be set in front of, or on, the family altar as an offering to the spirits of the ancestors. When the Bon celebration is over, the living family members eat the sweets. They are very pretty in appearance, and often molded into shapes associated with the afterlife, such as lotus blossoms and lotus leaves. 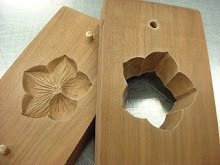 Usually they are of the rakugan family of confections, which are shaped in wooden molds, are very dry, and have a long shelf-life. Rakugan confections are often served as the sweet counterpart to the slightly bitter matcha tea in traditional tea ceremonies. Basic ingredients include rice flour, soy flour, and sugar. 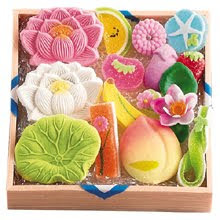 Though I have no use for butsudan offerings, each year I give in to the temptation to buy a box of these pretty sweets. But the truth is, I find them overly sweet and dry. Because I deplore wastefulness, I either force myself to eat them or give them away. Today, as I was flitting about the internet looking at photos of pretty Bon-gashi, I found a page that showed (with diagrams) how to turn one brand of these confections into a drink! I realized then, that I did not fully appreciate the possibilities of bon-gashi, and I plan to rectify this before the next O-Bon comes round.